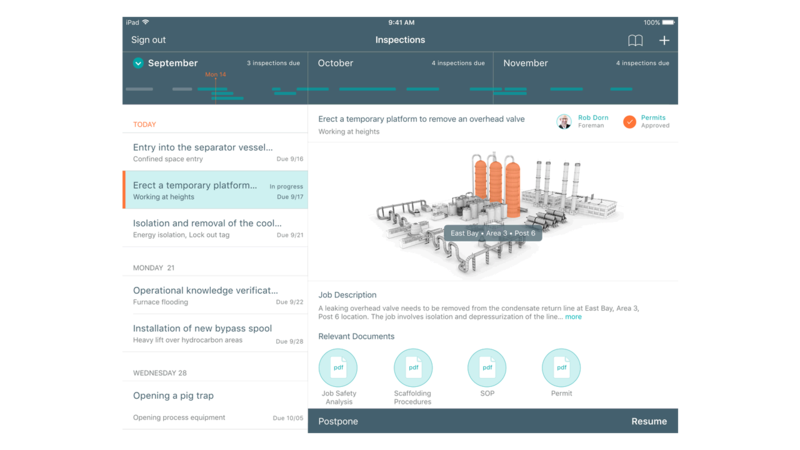 IBM MobileFirst for iOS Safety Inspect helps refinery and chemicals personnel perform thorough safety inspections and record their findings in real time. IBM MobileFirst for iOS Safety Inspect provides managers with the checklists, requirements, documents and analytics they need to complete thorough and accurate assessments. The app enables agile processes and instant corrective actions, and helps generate better safety insights company-wide. Performing a refinery or chemical plant safety assessment and knowledge verification requires collecting a lot of information and has been a time-intensive, error-prone manual process that did not enable real-time updates. Safety Inspect can minimize these issues with a variety of features, including real-time corrections and detailed inspection updates. Decrease pre-assessment prep time by viewing a single source of all relevant inspection details and standardizing audit compliance processes. Provide the information inspectors need to troubleshoot and fix issues in remote areas as well as take detailed notes on the safety audit. Establish consistent inspection processes and gain insights by analyzing organization-wide safety findings to identify areas for improvement and verify inspector compliance and knowledge.